Some gardeners detest them for eating their favourite plants and bulbs while others love to see them perform acrobatics in their garden. 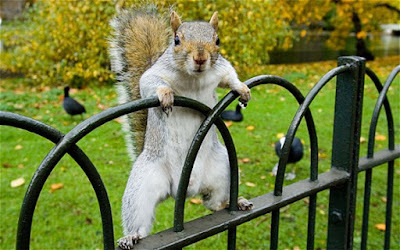 I am definitely in the second camp but if you want to learn more about squirrels (well it is Squirrel Appreciation Day on 21st January 2016 after all) in your garden then read on. I have some really cool facts about chilli and acorns! There are two types of squirrel, the red squirrel and the grey squirrel. The scientific name of the grey squirrel is Sciurus carolinensis. 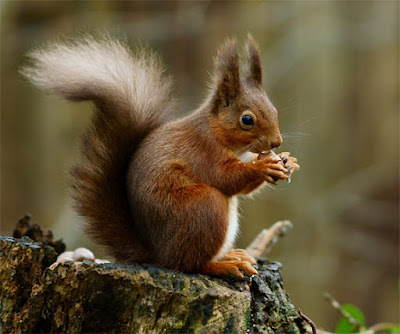 The red's posh name is Sciurus vulgaris. Contrary to popular belief, grey squirrels do not attack or kill red squirrels. They do take over their natural habitat though and as the greys are more competitive the number of red squirrels are in decline. 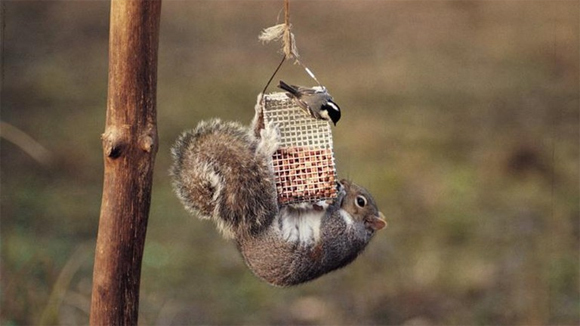 Both types of squirrels can cause damage in gardens though. Grey squirrels have twice the body mass of the red squirrel, hence their dominance! Grey squirrels love acorns but reds find them mostly indigestible. Who knew?! Other than a few small areas of Italy, the grey squirrel is not found in Europe outside of the UK and Ireland. The red squirrel, however is found extensively around Europe. Use netting to protect your plants, fruit, bulbs etc. Use squirrel proof bird feeders/tables etc so they are not attracted into your garden by your bird food. Hang old CDs and other creations which will make a noise and deter them. Set up decoy food stations - if you have yummy food on offer to them chances are they will leave your prized flowers alone. Get a pet - squirrels don't much like cats and dogs and will often go elsewhere. Add chilli powder or Tabasco to your bird food; birds don't mind it but squirrels do!! I love watching them scamper about. I hope on Squirrel Appreciation Day, you do too!